I was trying to mill the cast boring table I'm making today, and messed up an end mill trying to take off the skin in the slot on the bottom. A while back I made a small fly cutting mill to fit some odd radiused carbide inserts I picked up at the recent Bernardston meet. That mill worked great to take off the cast surface, and leaves a nice finish. I will make a larger version for the same inserts soon. But today I needed to clean up a slot, and my homemade fly cutter only works on a horizontal surface. I remembered I had a different card of inserts picked up a few years ago -- another bargain table special -- wasn't sure what they were, but I remembered they were square in shape -- and realizing that wasn't ideal. A diamond shape is what I will look for in the future -- seems more useful for making cutters. But thinking about it today, I realized a square shape might work well for just scraping out the slot corner and getting rid of the sand and hard spots. So a bit of a search located the card in a miscellaneous "treasure" box. I sliced off a section of 7/8" hot rolled I had on hand -- the same stuff I made the fly cutter out of. I clamped the piece in the mill and cut a flat down to the midpoint, and then milled a small pocket .125" deep by eye to fit the cutter. Then I transfer punched through the hole, drilled and tapped 8-32, and screwed the insert in place. I only had a round head screw, I'm sure it will work for light cuts, which is all I need for the present, but will pick up a flat head to fit next time I'm in town. Didn't get to try it out, as my in-laws arrived early at 4:30. Rats.... I want to see it cut! Is the insert on the right side or will you run it counter clockwise? Ha! Well I guess it will match the other one, which I have to run in reverse. But in that case the insert is at fault. This one is the fault strictly of myself! 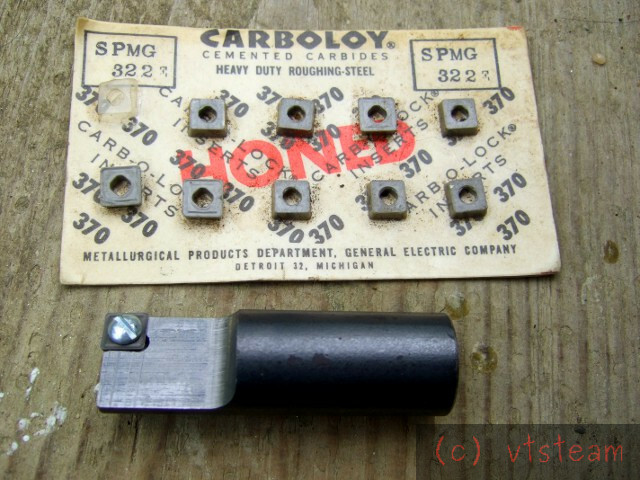 Just add another pocket on the other side and call it a universal carbide mill. Yes Don, I knew that when I milled it in the first place, of course, a universal mill. That's why I put relief on the end, too, backwards. Probably I'll just run it in reverse like the other one. Maybe I'll keep making them that way so I always know carbide=backwards! btw I just realized those are some OLD inserts -- notice it says Detroit 32 Michigan -- that's the old zone code before US zip codes -- If I remember correctly that was changed about the time the Beatles first hit America. Early 60's? Ahhh, they don't make inserts like they used to..........! Thanks, Andrew. Will be free tomorrow -- hope it cuts well. I can see I'm going to have learn how to set up to sharpen my other end mills. I believe I read somewhere that you can normalise cast iron by heating to red and allowing it to cool slowly, to reduce surface hardness. This would probably be practical on items the size of your cross slide. Worth a try on a piece of scrap. Thanks David -- I read about that too and might try it some day on an important chilled part. Hoping here that it's just a local sand dust problem in the skin rather than chilled iron. I usually grind off the skin with a hand grinder before milling , but couldn't do a good job in the slot corners this time. 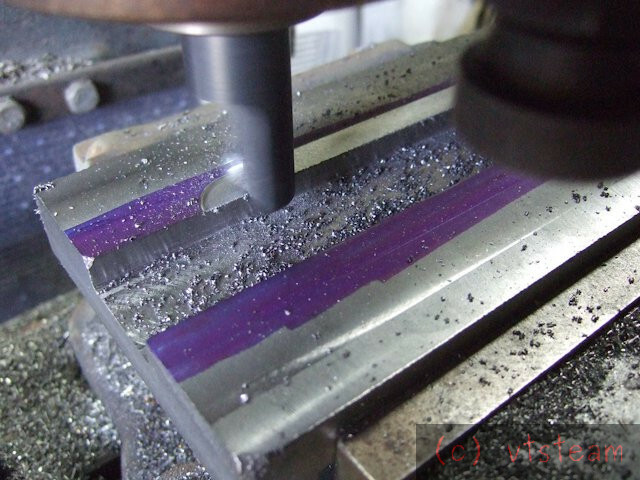 Hit that rough stuff with an end mill and the cutting corner is instantly dulled. Tried the new mill out even before coffee was ready. It did a fine job. 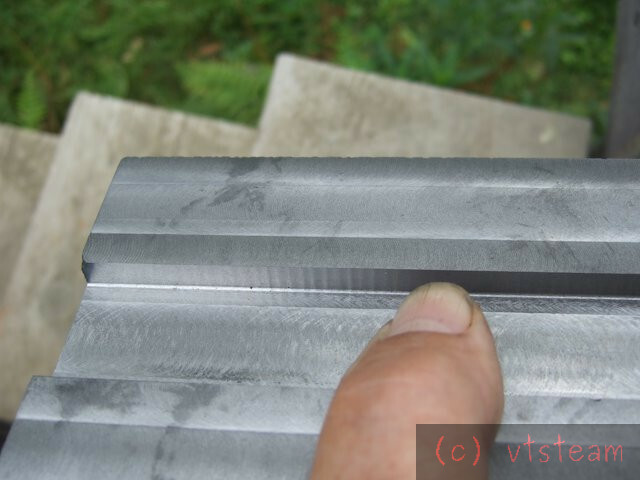 A bit noisy as the vertical cutting edge is wide and square, not helical, and it's a single point cutter. You can't take a deep cut. But it gave excellent results for what it is. It cleaned out the skin in the sand pockets nicely. In future, a slot would be better cut as gradually descending passes, using the easy cutting horizontal edge, rather than a horizontal traverse into a vertical edge as I did here. This mill would cut faster and much more quietly in that case. I'm thinking that if the tool were cut down in the shank you could actually make an official T slot cutter out of it. Not a fast tool then, but a low cost one -- how often do I need to cut or clean up T slots anyway? That looks like a respectable enough cut. Yes, but unless I'm visualizing it wrong, then you can't cut to a shoulder. Don't you need bottom relief, as in an end mill? You're right, you need a tip angle of less than 90 degrees to cut to a corner.... they'd be good on a lathe tool though, those square tips. Triangular would be better for your application? We use a lot of tooling that takes 80 degree Trigon inserts. Because of the angles involved, they're quite versatile. Look for "Wxxx". The others I see a lot for milling are the parallelogram inserts, "APKT" comes to mind. "CNMG" (80 degree diamond) can be very useful as well, and you can often use all 4 cutting points/edges in a well designed tool. Thanks Adev and Sparky. I'm sure I'll be making more tooling for inserts, with these and others as I pick them up -- probably always at a sale of some sort. It's fun making cutters and trying to figure out how to use this miscellaneous stuff. These square tips are working very well now on the mill I made -- I was right, cutting down with it is a far more effective method than positioning to cut the side of a groove --- you get the same internal square shoulder either way, but the former is much quieter and smoother, with a much better depth of cut. I bought a power feed for my 626, it is one of the best things I have aquired and only use hand feed on cross way. I have seen a few windscreen motor power feeds working very well.